After winning marriage equality in three states last night and stopping an anti-gay marriage constitutional amendment in a fourth state, a little bit of light also comes out of New York City. 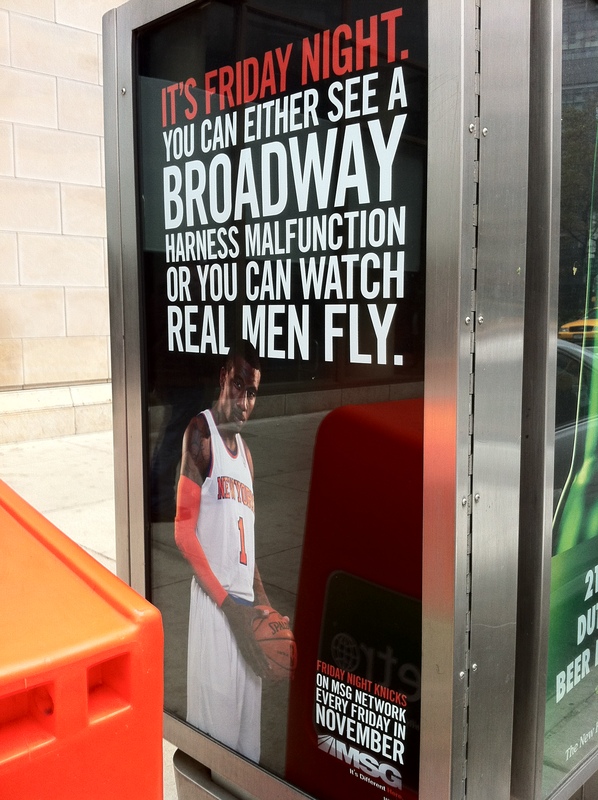 Earlier this week, we reported on an ad campaign being run by Madison Square Garden Networks. 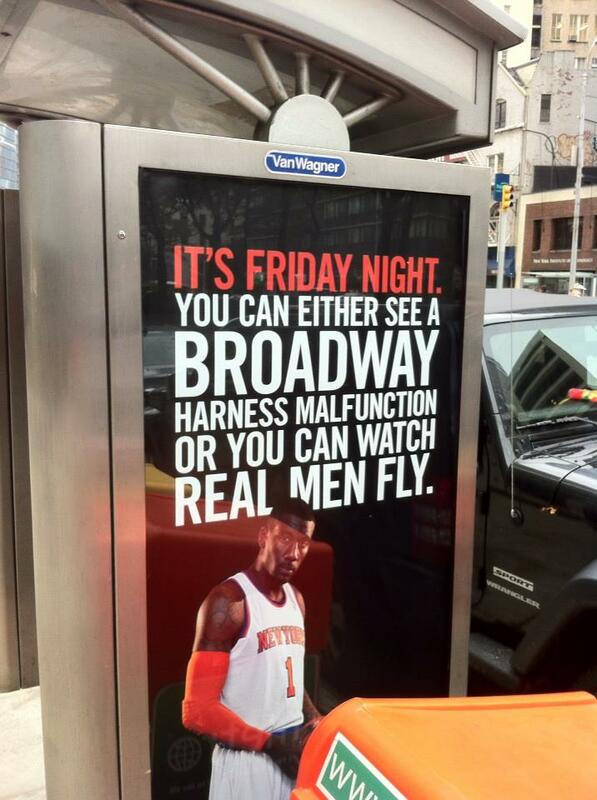 The ads were intended to get people to not do one thing on Friday night, and instead stay home and watch a New York Knicks game on TV. The words were referencing the multi-million dollar musical, Spiderman: Turn Off The Dark,” in which actors have been injured, including Christopher Tierney, who fell 30 feet from the air into the orchestra pit in December 2010. Tierney , who sustained four broken ribs and fractured three of his vertebrae, returned to the show four months later. Well done, everyone who contacted MSG and shared the story with your friends. Little victories like this do make a difference! On Tuesday, we have an extraordinarily important decision to make. Many look at the economy and wish the recovery was happening more rapidly. Some would like to see a larger return on their stocks. And a select few look at their family and hope each day for the same protections most every other family in the country currently has. You might remember a letter I posted last week from young Sophia Bailey Klugh. 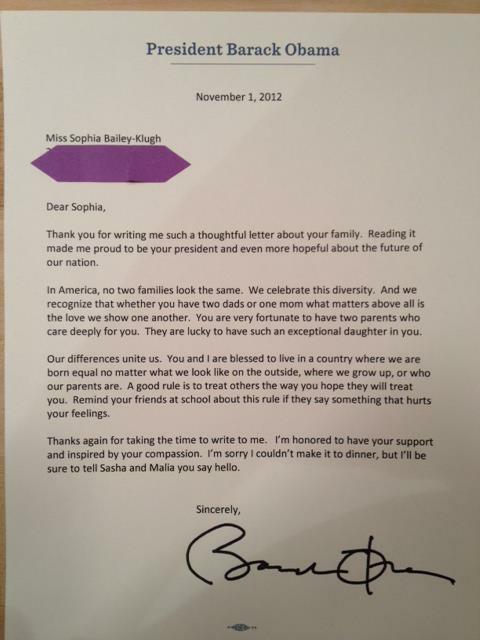 10 year-old Sophia penned a letter to President Barack Obama. In the letter, she told the President how happy she was that he agreed with her on the topic of marriage equality. You see, young Sophia has two dads. She continued on and asked the President an important question. Well, lo and behold, in the middle of his fight to be re-elected, the President took some important time to share a little advice with a little girl. Thank you for writing me such a thoughtful letter about your family. Reading it made me proud to be your president and even more hopeful about the future of our nation. Our differences unite us. you and I are blessed to live in a country where we are born equal no matter what we look like on the outside, where we grow up, ow who our parents are. A good rule is to treat others the way you hope they will treat you. Remind your friends at school about this rule if they say something that hurts your feelings. Thanks again for taking the time to write me. I’m honored to have your support and inspired by your compassion. I’m sorry I couldn’t make it to dinner, but I’ll be sure to tell Sasha and Malia you say hello. Governor Mitt Romney’s campaign recently stated that he believes gay and lesbian families visiting one another in the hospital is a privilege and not a right. Additionally, he has spoken out against gay parents adopting children. Finally, the Governor has pledged to write discrimination against LGBT people into the US Constitution. I hope that young Sophia wakes up on Wednesday morning to find there’s someone in the White House who believes her family should have the same protections as every other family in the country. It’s no secret that there’s some homophobia in professional sports, but the tide is turning. With pro athlete heroes like footballers Brendan Ayabendejo and Chris Kluwe, wrestler Hudson Taylor, Hockey player Sean Avery and dozens more speaking out for marriage equality, we can see things are changing. The insinuation that someone who spends a few months a year throwing a ball in a hoop is any more of a man than someone who does 8 shows a week literally breaking their backs as they do their acrobatics on a stage is not only insulting, but it’s utterly false. As a kid who grew up doing musicals, seeing an ad like this would have hurt me. Gay kids out there who happen to be attracted to something other than athletics are putting up with enough bullying from their peers and in many cases their families. They don’t need it from Madison Square Garden too. As New York has seen enough trouble this past week, let’s hope MSG quickly issues an apology and pulls down their homophobic ad. In conversations about this, I’ve found a few people don’t find anything offensive about this. One friend even advised that we shouldn’t get upset about this and we should instead wait until some NBA player calls someone a “fag” and no one does anything about it. The problem with this argument is that when the phrase “Real Man” is used as a pejorative against another person, it is nearly always the same thing as calling someone a “fag.” Everytime that phrase has been used to insult someone in the last 50 years, it has been to question someone’s masculinity and/or their sexuality. That’s why I think this is important to point out. This is essentially the same as an NBA Player shouting “fag” at someone, except this time it’s on a phone booth in New York and no one is saying anything about it. After some calls to Madison Square Garden, I’ve found it’s an ad for MSG Networks and I’ll update you when I receive a response. h/t to Richard Roland, who took the photos.